(Everybody knows that basketball people walk around with at least one radar apparatus). The Knicks head into this off-season in a similar predicament to the one they faced after acquiring Tyson Chandler in a big ol' sign-and-trade last year. Even after sorting out their various financial exceptions and the possible retention of Jeremy Lin, et al., they'll have a handful of open roster spots and almost no money with which to fill them. This past season, interim GM Glen Grunwald built a pretty nice supporting cast out of very small contracts, in part because he was willing to accept talented, well-known players whose value had been tainted in one way or another. The Knicks signed Baron Davis even though he was rehabilitating from a back injury, then saved some cash until mid-February so they could add J.R. Smith once he returned from his lockout stint in China. Unless the Knicks want to settle for a lot of unproven youngsters or overcooked oldsters (not the worst thing in the world), they'll need to get similarly creative to flesh out their roster with talented humans. 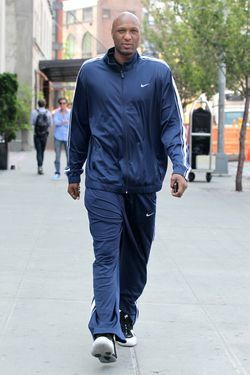 Enter Lamar Odom. Odom has long been a beam balance between immense, versatile talent and interfering issues. This past season — his first since being traded to the Mavericks — the scale was tipped waaaaay in favor of the issues. There was grave, genuine trouble following the death of a close cousin and Odom's involvement in a car accident that killed a young cyclist. Later, there was an awkward departure from the Lakers, a struggle with injuries and conditioning in Dallas, and ample fretting over distracting off-court ventures like all those Kardashian shows (Odom is married to Khloé Kardashian, in case you live under a rock in paradise and didn't know). Meanwhile, he played very disappointingly in 50 games for Dallas before being asked to leave the team in April. Odom still has a year left on his contract, but the Mavs are reportedly considering buying him out of his remaining $8 million. If the Mavericks are forced to waive Odom, he would become a free agent. In that scenario, the Queens native would likely be looking at a significant pay cut from the $8.2 he was scheduled to make this season. Would he be interested in coming to New York at a discounted rate? A source with knowledge of Odom's thinking says yes. The source says the Knicks would be "on the top of his list" if Odom became a free agent. "Lamar is big on being comfortable," the source said. "And New York is somewhere he can be comfortable." Again, Odom is a dynamic player, 32 years old, and in relatively good health, so this is intriguing. Well, let's clarify that: For a minimum deal, Odom is all of those things and a nice, creative use of the scant leftover money. For a more significant contract, his state of mind gets a little more worrisome, and one wonders if Odom can truly return to form. And the Knicks just probably couldn't afford him anyway. So, thanks for the interest, Lamar! We're flattered! Let us know if the Mavs fail to trade you and then waive you and then you're willing to play for the least amount of money possible. Thanks!